See shiny things. Bid on things. Help great charities! As some of you know I’m a member of the Alberta Browncoats which is a not-for-profit society who regularly raises money for charities through screenings, fundraisers and shindigs. All these events are relatively local but we all know fandom doesn’t stop locally. A certain Captain Jack Harkness (John Barrowman) wisely imparted upon us a suggestion that we branch out in our fundraising activities to share our donated goodies with the rest of the world. Unlike the residents of the Torchwood Hub, we listened to him. An annual online charity auction. Bids from all over the world are accepted. Items will change as the month progresses. Items so far include Firefly, Doctor Who, Supernatural, Castle, comics and MORE! Go and register, bid and then bid some more! The proceeds of this auction will be split between Edmonton’s Youth Empowerment and Support Services (a shelter & support program for homeless teens), Kids Need to Read (a US-based children’s literacy charity), Equality Now (an international women’s advocacy organization), and the Comic Legends Legal Defense Fund. Our goal is to raise $5,000 USD to split between these wonderful organizations. Verity! Extra! 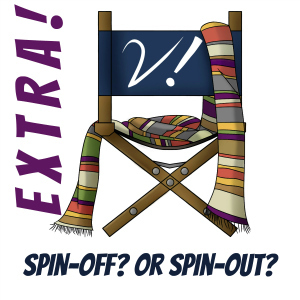 – Spin-off? Or Spin-out?